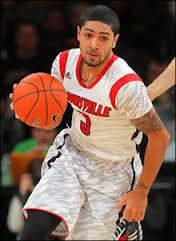 The Louisville Cardinals are on a roll. The squad won the Big East for the second straight year, then gained a number one overall seed. Their hot streak should not stop there. They will the play the winner of Colorado State and Missouri. Louisville already handled Mizzou earlier in the year meaning the team they should fear the most would be the Rams who present five seniors. How did Oregon, a 26-8 team that won the Pac-12 tournament reach a 12 seed? They will get the Cowboys of Oklahoma State led by super freshman Marcus Smart. If they get big contributions from big men Arsalan Kazemi and Tony Woods they should use their size to beat OSU. Assuming Duke beats Albany in the second round they should be very worried about their next matchup.They will either get the Creighton Bluejays, the king of the Missouri Valley or Cincinnati who looks like they are climbing out of a slump. The importance of Ryan Kelly should be shown in this game. Creighton's star Doug McDermott can stretch the floor, dominating in the low post then using his arsenal of skills to hit shots on the perimeter. Kelly is very mobile, as he can easily guard McDermott nobody where he is. They will also need Kelly to handle the Bearcats' undersized forwards. Many might look at St. Louis and right them off. But, if the Billikens can get past an interesting New Mexico State team in the second round they can easily hit the Sweet 16 and might even have a chance at pulling an upset over Louisville. They went 13-3 in a pretty tough Atlantic 10 thanks to great play from junior Dwayne Evans who led them in points and rebounds per game. They also have a load of ball handlers at should help them against pressure defenders. This isn't the best Michigan State team we've seen the past couple of years but they should still be a tough out. Few teams can match colossal Derrick Nix in the paint and they have fantastic guard play from Keith Appling and Gary Harris, both good shooters. They should roll past Valpo and eventually into the Sweet 16 which I believe they will meet Duke. It should be a great game and we could see the Spartans in the Elite Eight.